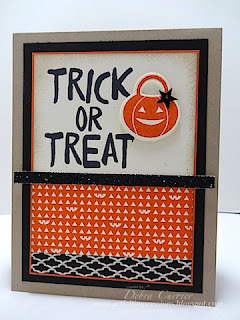 ARTfelt Impressions: Trick or Treat! Hello everyone! I hope your week is off to a great start! I seemed to drag yesterday but I was still able to get through it. Fall break is coming. Hang on!! Lol! I am hoping that I can get myself focused before then. I have things that I need to get finished so I can enjoy my time away! Today's card was one that I did for a recent swap I was in. Thanks for stopping by and have a super day! CCMC September Mini Edition News!